Low-altitude flybys by the recently retired Cassini spacecraft have shown Saturn’s electrical environment to be surprisingly dynamic. By manoeuvring Cassini into a series of orbits that took the probe within the planet’s innermost ring, researchers obtained direct measurements of the electron density and temperature in the ionosphere. 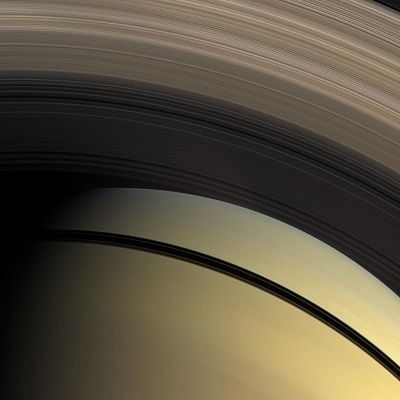 The results revealed that the variability and fine structure of the plasma conditions close to Saturn are due in part to the way in which the A- and B-rings prevent ionizing solar radiation from reaching the upper atmosphere. Before April 2017, when Cassini began a series of close orbits around Saturn, study of the planet’s ionosphere was limited to averaged, low-resolution measurements acquired using remote-sensing techniques. Now, writing in Science, Jan-Erik Wahlund and collaborators at the Swedish Institute of Space Physics, University of Iowa, and NASA Goddard Space Flight Center, have reported the results of an in situinvestigation using Cassini’s onboard Radio and Plasma Wave Science (RPWS) instrument package. Where Saturn is illuminated directly, extreme ultraviolet (EUV) radiation from the Sun partially ionizes the upper atmosphere, producing electrons and hydrogen ions. The planet’s two most prominent rings, however, are opaque to EUV radiation, and in their shadows the researchers found a local decrease in plasma density. The lack of charged particles in this region could explain the previously observed leakage of lightning-induced radio signals, which would otherwise be blocked by the ionosphere. Variability was also observed away from the rings’ shadows, with electron densities fluctuating between 50 and 1300 per cm3 from one orbit to another. Wahlund and colleagues propose that these inconstant conditions, too, are caused by the rings – in this case by the electrodynamic interaction between the ionosphere and the electrically charged D-ring. Resulting flows of ionospheric ions along magnetic flux tubes could impart the fine structure observed by the spacecraft. An additional effect might be caused by reactions between negatively charged molecules delivered from the D-ring, and ionized hydrogen from the atmosphere, which could combine to locally depress the population of ion species.